Johns Creek is along the Chattahoochee River, so flooding is a common issue in this part of Georgia. It also sees it’s fair share of rain and storms through the spring and summer months. This excess water can really put a lot of undue stress on your foundation. It definitely can lead to the need for a foundation repair Johns Creek Georgia team that knows how to find the right solution for your needs. 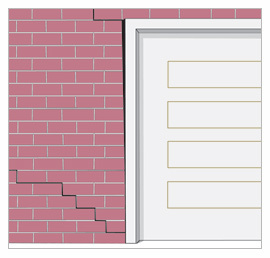 If your home is needing foundation repair, then Atlas Piers offers many different products for your problems. We can install resistance piers to help stabilize your foundation or helical piers for the more heavy duty job that can handle loads of weight. Having your home back into its original position will not only make you feel better but also your home will be safer and last longer. To fit every foundation repair situation, we offer a variety of resistance piers, including: steel push piers, helical piers, slab piers, porch piers, and new construction piers. We use only “the very best” in foundation repair products from Earth Contact Products. These products really are the industry standard for which all other underpinning products need to live up to. Atlas Piers of Atlanta offers helical tiebacks as a sure solution for walls that are bowing. When there is pressure on your foundation walls from excess water that has built up, or soils that have expanded, it is very possible this pressure can push in your basement walls. When you notice your walls are bowing, it can be a very scary thing. The great thing is when tiebacks are used, you will have support for these walls for years to come. They are easy to install with minimal disturbance to your home. You can rest assured that your foundation will remain sound and strong with our helical tieback anchors installed. Another way to repair bowing or cracking basement walls is to use carbon fiber strips. these strips are applied to the wall to strengthen it and lock it in place, closing any cracks that may have formed. Because they can be installed quickly and require no maintenance, carbon fiber repairs are becoming increasingly popular. They are also a very “green” solution. Sometimes, due to the makeup of the soil around your home, when excess water washes away that soil or erodes it, voids can be left. Atlas Piers of Atlanta offers a solution to this problem with our pressure grouting solutions. We will pump grout into your void under your foundation or slab and provide the support needed to carry the weight of your home. With our pressure grouting you’re rest assured you won’t have a void opening up under your home. Another service that we offer is crawlspace encapsulation. This involves the installation of a vapor barrier along the walls of a crawlspace or basement. The barrier prevents moisture from seeping into the area, leading to a dry, mold-free home with fresh air throughout. Encapsulation services are especially useful to those who live in areas that receive lots of precipitation or are especially wet, such as Johns Creek, Georgia. Atlas Piers also offers shoring repair in Johns Creek Georgia. For all your shoring support needs you can count on the professionals at Atlas Piers of Atlanta. We can help with your reconstruction shoring needs or new construction shoring needs. 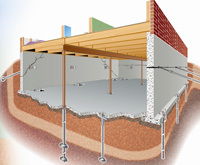 Shoring adds support when building walls or during the reconstruction process. We offer many different solutions for many different problems such as leaning walls, leaning chimneys, sticking doors or windows, and many more. So for these and many other solutions, call the professional team at Atlas Piers of Atlanta. We are your foundation repairs Johns Creek Georgia team. We want you to have a safe and healthy home, and we can help you achieve that goal. Make the call today!